A few days ago, the words "Live Girls" appeared on the marquee of the NorShor Theater. Someone changed that to "Livers." And lots of people thought it was all a joke. But Jim Gradishar is serious. He runs an adult book store in Duluth, and he plans to open an "upscale burlesque club" in the theater later this summer. He says the art deco building is perfect for his plans. The glass entry doors are etched with graceful swirls. He leads a quick tour past a wide staircase, which sweeps past a carved wooden mural representing the area's history. "The entryway here is going to be like a nostalgic area somewhat, with some antiques, like the big projector," Gradishar says. "We're going to have a player piano. This place is like a museum, and I want to keep the feeling, the old feeling, the retro feeling of this building." Gradishar says he was really taken when he first walked into the NorShor a few months ago. "It's an amazing building, and it's a shame to see it empty. And a lot of people say it's a shame to do what I'm going to do here," Gradishar admits. "But it's a sad waste, and I think we can make money, and we can keep the doors open and pay the rent, and Eric'll be able to keep the building." "Eric" is Eric Ringsred, an emergency room doctor who owns the NorShor and several other old buildings in downtown Duluth. 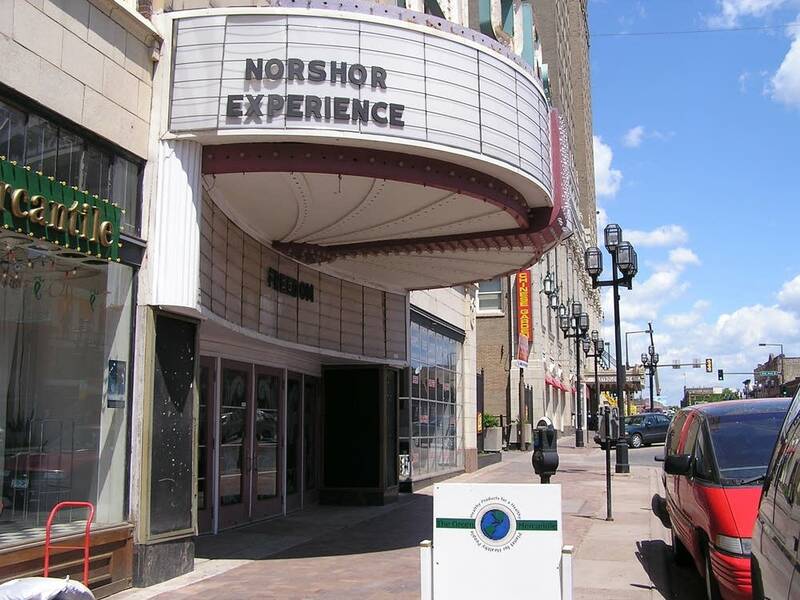 The NorShor is the crumbling crown jewel in a shabby part of downtown that local boosters have been saying is on the verge of a renaissance -- for years. Ringsred has leased the building to various managers who have run bars, concert series, local music acts, fundraisers -- everything they could think of -- but they've all been forced to give up. It's an amazing building, and it's a shame to see it empty. And a lot of people say it's a shame to do what I'm going to do here. But it's a sad waste, and I think we can make money. In the meantime, Ringsred has championed historic preservation in Duluth. He's taken the city to court to keep some historic buildings from being torn down. He's lost some of those legal battles. And now he says he thinks he's finally found a business that can make money at the NorShor Theater. "To some extent I think I'm just going with what I see as the future of area, which is not a historic district at all anymore. It's a district full of hotels, perhaps some tourists, a gambling casino and what-not," Ringsred says. The casino, in the old Sears building, is owned by the Fond du Lac Band of Chippewa. One new downtown hotel is under construction, and another could be built on the site of a building Ringsred tried to save. But he says he's not doing this to thumb his nose at the city, and he's not upping the ante in the hope that someone will come along and buy the NorShor. Ringsred says the burlesque club will add diversity to the downtown. "If you've been to any of the great tourist centers of Europe, like Amsterdam, Paris, or in this country, Las Vegas, San Francisco, New Orleans," he says, "they all have a mix of the fringe types of entertainment and activities, along with main street stuff." Ringsred says don't think shabby peep show, think classy, like Las Vegas. But the neighbors ain't buying. "Classy strip joint, yeah," Dianna von Robenau scoffs. "I'm sure it's possible. I don't think Duluth is ready for it." Von Robenau owns the Green Mercantile, an earth-friendly general store next door to the NorShor. "We've worked so hard to build a family-oriented block around here, and bring families to our businesses -- bring in families to the therapists on the corners, and to the doctors, computer businesses -- turn things around, make things feel safe for people again," she says. "This is not going to feel safe for them." Von Robenau says she and other neighbors are collecting signatures and sending a letter to Eric Ringsred, asking him not to let the NorShor be used as a strip joint. Duluth Mayor Herb Bergson says he wants to sit down and discuss things with Ringsred, too. 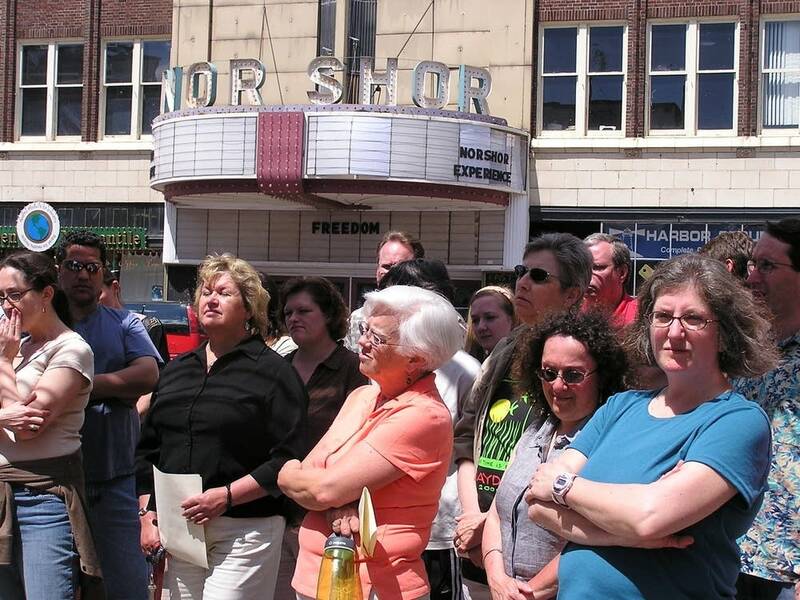 Bergson says the city has been trying to build an arts and cultural neighborhood here, and generations of people have supported Ringsred's efforts to keep the downtown theater open. "Like myself, and my wife, and my kids have come to the NorShor to fundraisers, and participated in them to to keep NorShor open," Bergson says. I didn't spend that money to see it turn into strip parlor." The city has no ordinance on strip clubs. 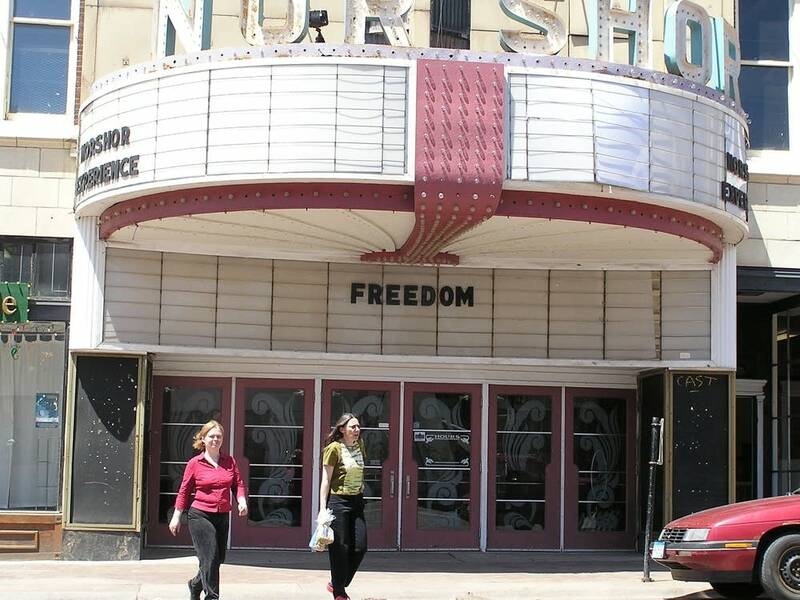 A new state law restricting such clubs would outlaw a downtown location. But a legal challenge is expected, and could even involve Ringsred and Gradishar. They're no strangers to legal battles.